Overloud announced the release of a new plugin in the GEMS series, the EQ550 equalizer modeled on the basis of the well-known American EQ API 550 manufactured on custom operational amplifiers. The EQ550 extends the characteristics of the original equipment – the Cue buttons give you the opportunity to hear part of the frequency spectrum that is affected in this range, and continuous selection of the frequency allows you to select all intermediate frequencies and optionally the middle range. The EQ550 is built according to the Proportional-Q scheme – this means that the filter bandwidth becomes narrow as the gain increases. To adjust the low EQ provides a smooth tone, and its character becomes more and more aggressive with increasing gain band. This principle of operation makes the EQ550 unique. 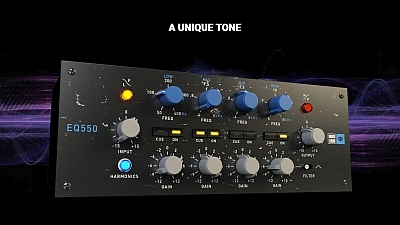 In addition to the hyper-realistic imitation of the original Proportional-Q equalizer thanks to the 4th generation DSP technology, the EQ550 provides you with low processor utilization, multi-level undo / redo, A / B comparison, real-world presets and a little surprise – you can take notes anywhere plug-in panels. System requirements: Core i3 1.4GHz with 4Gb of RAM, 1280×800 video. Windows Vista, Windows 7, Windows 8 and Windows® 10 are supported. Macintosh® Intel Core i3 1.4GHz with 4Gb of RAM, 1280×800 video. Mac OS X 10.6 Snow Leopard and above are supported.